Every political season I see magazines and newspapers use campaign buttons in some sort of illustration. 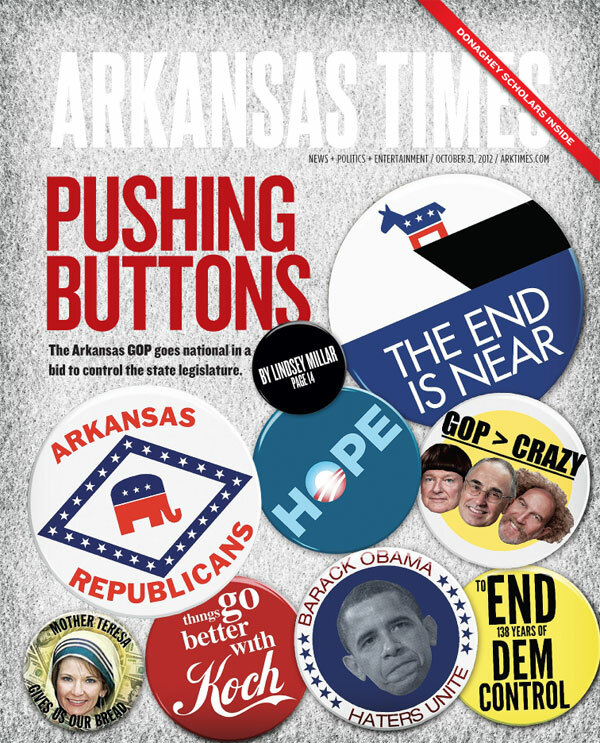 I’ve been designing magazines and newspapers for six years or so and I finally got to make my own buttons. I’m not sure how the opportunity avoided me all these years, but I’m glad we finally had a concept that would work. This cover went through several iterations. We worked hard to get the buttons just right (but still random). We went with buttons with the headline, leaving the hidden messages in the buttons as the headline until finally we decided to make the buttons separate from the headline. By the way, if read just right there are indeed some little hidden nuggets within the buttons and the way they are arranged. My only quibble is the background. Didn’t quite work as I’d hoped it would.